Dependable Direct's Industrial Grade packing tape was born out of a search for the most durable, hard-working and efficient tape on the market. Worry Free Packaging: Designed with premium acrylic adhesive to secure your packages with confidence for months.Perfect for Warehouse, Home or Office: This versatile tape is built with strength and holding power in mind to serve a wide variety of applications. Whether using this for storage, moving or packing boxes in a warehouse, this tape is designed to meet industrial level specifications. 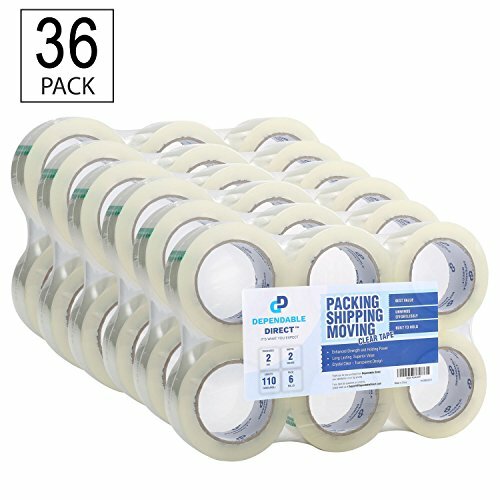 LONG LASTING - MORE TAPE FOR YOUR MONEY: Ever run out of tape half-way through a box? We certainly have and it slows us down. We want to eliminate that situation as much as possible by including, in every roll we sell, a whopping 3,960 inches (110 yards) of HARD-WORKING, packing tape so you can get the job done right, every time. Plus, you can save even more by buying in bulk with our 36 unit case packs. CRYSTAL CLEAR, TRANSPARENT DESIGN: For those projects or situations that may require a more aesthetic appeal, our acrylic adhesive tape is designed to appear crystal clear. Of course, without sacrificing strength and durability.